Stay productive with the HP 15.6" 255 G7 Series Laptop. The 15.6" display features an HD 1366 x 768 screen resolution and a 16:9 aspect ratio. The anti-glare finish helps reduce glare. Visuals are handled by the integrated AMD Radeon R4 graphics. You can also output to an external display via the HDMI 1.4b port. The system is powered by the 2.6 GHz AMD A6-9225 dual-core processor. It also has 8GB of 1866 MHz DDR4 RAM, a 256GB M.2 SATA SSD, an SDXC media card reader, 10/100/1000 Mb/s Gigabit Ethernet, Wi-Fi 5 (802.11ac), Bluetooth 4.2, USB 3.1 Gen 1 Type-A, and USB 2.0 Type-A. Windows 10 Pro (64-bit) includes all of the features of Windows 10 Home plus many designed specifically for business users, including Hyper-V virtualization, BitLocker disk encryption, and remote desktop access. Devices will also be able to join domains and the Azure Active Directory, and they can even access a specialized version of the Windows Store featuring custom, company-specific applications. This laptop features an AMD A6-9225 processor. Its dual cores can reach a base clock speed of 2.6 GHz and be boosted up to 3 GHz. 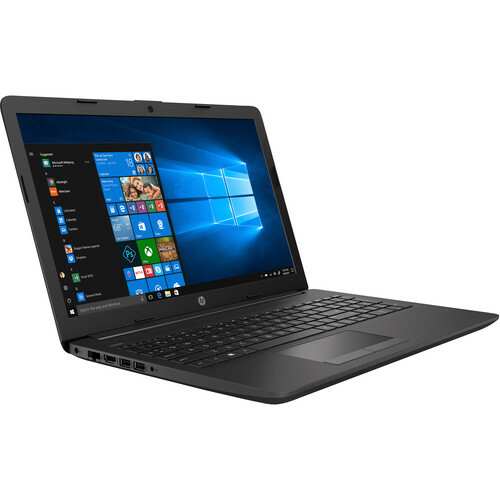 This laptop offers Wi-Fi 5 (802.11ac) as well as a Gigabit Ethernet RJ-45 LAN jack so you'll be able to have fast wired or wireless internet access. Bluetooth 4.2 technology allows you to connect various peripherals wirelessly. Box Dimensions (LxWxH) 19.0 x 12.4 x 2.7"